These are about the very first hooks i made. 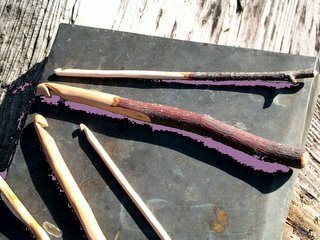 I made them from branch pieces, formed the hook, sanded them smooth, at least at the hook part, and gave them a good rub down with treewax. I'm thinking that the likes of these might have been made and used by pioneers who didn't have access or couldn't afford fancy storebought baleen, ivory, or nice hardwood lathe turned hooks. Of course, this is speculation, but it stands to reason that if you're out in the sticks, and you have no other access to tools, you make your own, right? Anyway, if you've a notion to go way back and give some totally primal hooks a try, i can do those too. Sizes are little, bigger and big... from roughly an H (little) to a Q+. It might well be that the earlier hook carvers did more than i have in an attempt to remove bark and such, but i've always liked to leave a little bit of the character of the donor tree in the hooks i make... its a team. These i think will sell for the same as the other hooks ($15 each) but if you want, i'll fudge a bit and rub them down with poly oil for a little bit harder finish. The little forked birch hook at the top of the photo is still available if someone wants to buy it. Its about a 4.75mm according to my "Bates"tm size gauge. that little one at the top is my FAVE i cant believe no one has snagged that one up !! Welp Three... it just got snagged. I want to make lots more of these though... you think they'll sell? I'd think that someone who spins would love to have one or more of these, simply because they're so organic. I really hope they take off, cause i love to see that wood under the bark come alive... lots of beautiful natural figure in those little sticks.